Fear doesn't come naturally to Mathilda Savitch. She prefers to look right at the things nobody else can bear to mention: for example, the fact that her beloved older sister is dead, pushed in front of a train by a man still on the loose. Her grief-stricken parents have basically been sleepwalking ever since, and it is Mathilda's sworn mission to shock them back to life. Her strategy? Being bad. Mathilda decides she's going to figure out what lies behind the catastrophe. She starts sleuthing through her sister's most secret possessions—e-mails, clothes, notebooks, whatever her determination and craftiness can ferret out. But she must risk a great deal—in fact, she has to leave behind everything she loves—in order to discover the truth. Startling, funny, touching, odd, truthful, page-turning, and, in the end, heartbreaking, Mathilda Savitch is an extraordinary debut. "I want to be awful. I want to do awful things and why not? Dull is dull is dull is my life." “As a writer, Lodato understands the true and ugly side of mourning. Trying to provoke her parents, Mathilda dresses up in her dead sister’s birthday dress. Numb, in search of deeper numbness, her mother downs the vodka, and crawls on the kitchen floor, howling, in search of another bottle. Victor Lodato is a playwright, poet and novelist. He is the recipient of Guggenheim and NEA fellowships, and has won numerous awards for his plays, including one from the Kennedy Center Fund for New American Plays. 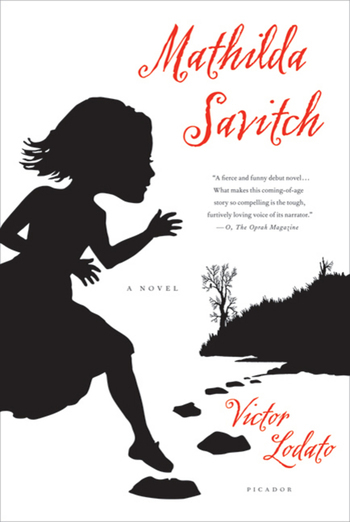 Mathilda Savitch, his first novel, received the PEN USA Literary Award and was named a Best Book of 2009 by The Christian Science Monitor, Booklist and The Globe and Mail. He lives in Tucson and New York City.